Embroidery offers that old school extraordinary elegant touch. Needle & thread create art & design. We can embroider some luggage, bags and large items. Embroidered shirts are great for more than corprate apparel & personalized t shirts. On site digitizing services, 12 piece minimum to start. You can also supply your own goods. The art of embroidering textiles dates all the way back to the third century B.C. where the simple process of sewing a patch, mend and reinforce shed light on the ability to customize the shape and form of the stitching to a decorative art. It has always been a sign of social status because the elaborate and beautiful stitch work was time consuming and labor intense. With the onset of the industrial revolution, embroidery has become something everyone can afford and now with the digital age it is easier and faster than ever to get your own clothing custom embroidered with superior craftsmanship! Embroidery is no longer just for the well to do. It adds a touch of dimension, depth and texture like no other process. The satin or column stitch gives off a shine at certain angles that can be seen from across the room. Commonly viewed as a step above screen printing, at Choice Image you can choose to have items professionally embroidered with your designs or logos. Whether it is corporate apparel, casual wear, promotional items or gifts, your orders will be prepared with state of the art computerized machines by experienced professionals. We have years of experience and the ability to reproduce your logos and designs so that you can present an image that tells everyone that you are proud and successful. Your orders will be prepared using top quality items, threads and backings and without cutting corners. We take pride in the quality of the products that we prepare for you and we want you to get an item that will look great and last for years to come. For a different look, we may also choose to do Appliqué style decorations that allow the use of fabrics as the background in larger areas or even three dimensional “puff” embroidery on some items like baseball caps. 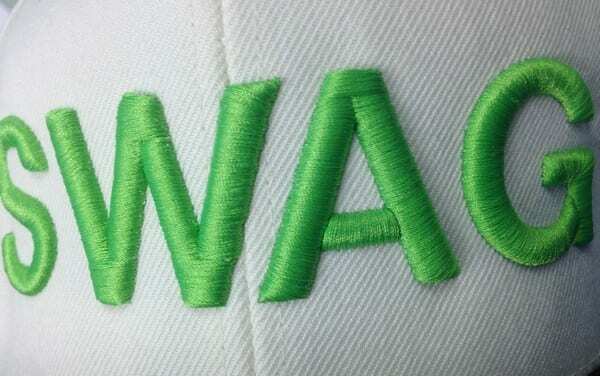 The list of products that can be decorated with embroidery is extremely long and includes apparel items like Golf Shirts, Woven Shirts, Tee Shirts, Sweat Shirts, Caps, Robes and Jackets as well as other items like Bags and Towels. There are also hundreds of thread colors to choose from that allow us to match almost any color, we offer metallic threads too. Let us know what you have in mind and we will gladly work with you to create a program that keeps your employees looking good and will enhance the image that you present to your customers. 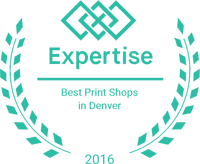 Embroidery denver, shirt embroidery, employee uniforms. This is the most common embroidery stitch type and is used in the majority of lettering and design outlines.In this example, you can see the center of the “O” is filled using a fill stitch. 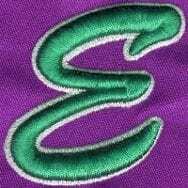 The edge of the “O” is reinforced using a satin stitch. 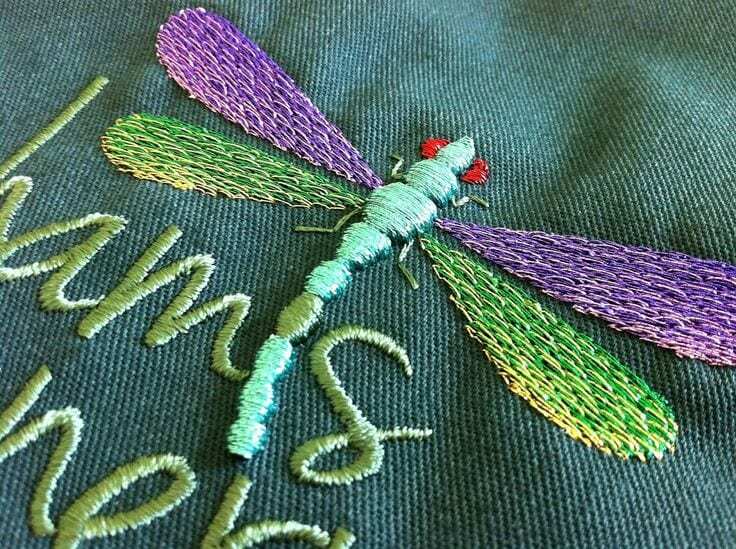 The other text uses a satin stitch as the fill and outline. The blue “NOW” text is also satin stitch. This design is sewn over a screen print – clever mixed media approach! This type of embroidery stitch is also referred to as a running stitch. The dashed line style is typically used to capture very small details in embroidery designs. The walking stitch is commonly used to re-create the look of hand sewing in many retail designs. This stitch is used to fill large areas of color. 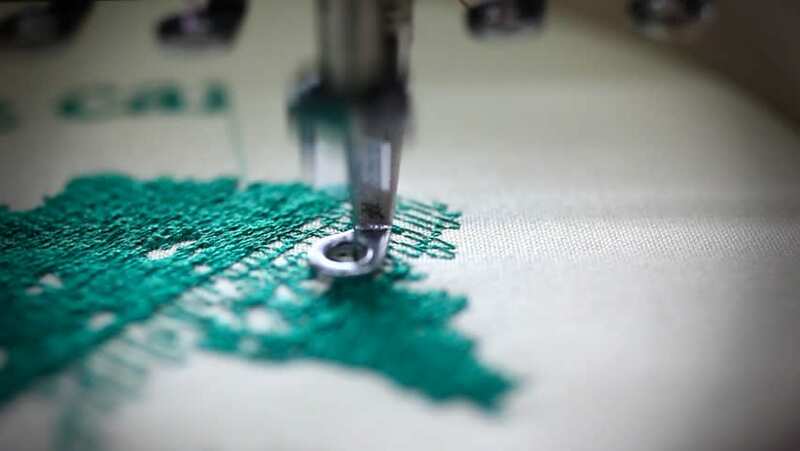 The fill stitch is also used to create an underlay foundation to layer more complicated embroidery designs or designs being sewn on flimsy materials (rayon, silk, etc). On high pile garments such as fleece, a fill stitch may be used to create a foundation so an acceptable amount of detail is not lost in the fabric fibers. Aprons and chief’s coats, jackets and hats for food service vendors. Golf towels , Golf bags and even gloves Polo shirts, oxford & Henley for corporate apparel. Hats and caps of every type. Embroidered company shirts are fashionable, reasonably priced and have a high perceived value. This year’s trends in the market see companies upgrading to higher quality brand names, more ladies specific company shirts, performance golf shirts and colorful and fun company shirts. The “casualization” of corporate America is here to stay and your embroidered company shirts will generate lots of exposure every time your employees wear them. At Choice Image, we employee a 12 head Tajima embroidery machine that will sew dozens of thread colors in short order. Our friendly and professional staff is here to answer any questions you may have about our company or our services. Your apparel will be as unique as you choose to make it. Items can be ordered from many catalogs or bring in your own item to be embroidered. 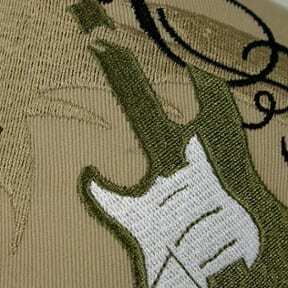 Embroidery is the process of sewing a digitized design onto garments. Once we have your logo or design digitized in software format, it can be loaded into our computerized machines for sewing. Each product that comes off one of our machines is individually checked for compliance with our quality standards. Our goal is to ensure that your products are representative of our highest quality service every time. Sewn art creates an impression of quality & style. Excellent for polo’s, jackets, caps, knitwear etc. Needle sew thread will normally outlast any garment onto which it is applied. Recent advances in software mean that design set up costs can be low and the new generation of machines run quickly with any number of colors being applied in a single operation. However, large designs can be time consuming to produce & so costs can increase significantly relative to the size. Embroidery creates an impression of quality & style. Excellent for polo’s, jackets, caps, knitwear etc. Embroidery will normally outlast any garment onto which it is applied. Recent advances in software mean that design/set up costs can be low and the new generation of machines run quickly with any number of colors being applied in a single operation. PROS – long lasting, looks expensive, full color at no extra cost. CONS – more expensive than printing, especially for large designs. As with all work at Choice Image Inc. everything is done write here. This includes the actual digitizing of the design . This gives us total control over your job, from adjusting the stich count for both quality and price, to selecting just the right thread colors to make your logo or design really shine. At Choice Image our work only looks more expensive than our competitors. Feel free to fill out a free quote form HERE and find out just how affordable logo sewn garments are. Looking for that special product? Check out our online apparel catalogs for brands, styles, colors and even downloadable specs on garment measurements and care instructions. We are happy to order samples for you to feel and try on if we do not have them in our showroom, once you place an order with us. Corporate apparel produced in Lakewood, Colorado. 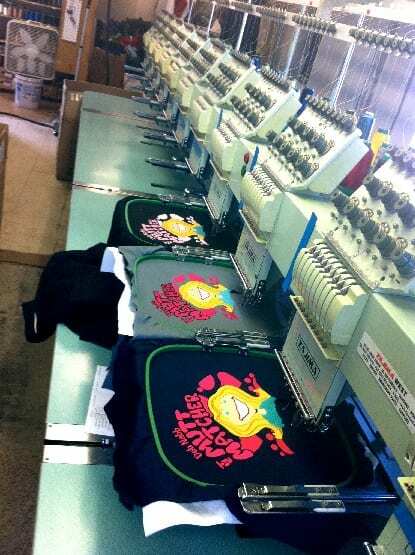 We can sew and or screen print any garment for your company & employee needs. Here are some ideas of the products we produce. Corporate attire done fast cost effective and correct. Get your business and employees noticed. Keep them warm and safe with jackets and outerwear. Outfitting employees in custom sewn and printed jackets, shirts and other clothing items is a great way to boost employee moral as well as promote your business and give it that professional look. Choice Image also offers a variety of promotional giveaway items like pens, flashlights, key chains and thousands of other ideas to get your business or company noticed! Employee incentives and awards are another great idea. How about a leather jacket for that twenty years of service? Keep your service staff warm this winter while both promoting your brand and helping clients feel secure. Printed and embroidered caps, hats, gloves, jackets give your staff that complete look. Choice Image also offers a great variety of restaurant staff garments and clothing items, chefs hats and jackets, wait staff aprons and even napkins, tablecloths and chair-backs for your dinning room. It is more cost effective then you may think to create and get custom printed attire, clothing and garment accessories for your business image. It has always been a sign of social status because the elaborate and beautiful stitch work was time consuming and labor intense. With the onset of the industrial revolution, embroidery has become something everyone can afford and now with the digital age it is easier and faster than ever to get you own clothing custom embroidered with superior craftsmanship! Embroidery is no longer just for the well to do and adds a touch of dimension, depth and texture like no other process. The satin or column stitch gives off a shine at certain angles that can be seen from across the room. Commonly viewed as a step above screen printing, at Choice Image you can choose to have items professionally embroidered with your designs or logos. Whether it is corporate apparel, casual wear, promotional items or gifts, your orders will be prepared on state of the art computerized machines by experienced professionals. We have years of experience and the ability to reproduce your logos and designs so that you can present an image that tells everyone that you are proud and successful. Your orders will be prepared using top quality items, threads and backings and without cutting corners. We take pride in the quality of the products that we prepare for you and want you to get an item that will look great and last for years to come. For a different look, we may also choose to do Appliqué style decorations that allow the use of fabrics as the background in larger areas or even three dimensional “puff” embroidery on some items like baseball caps. 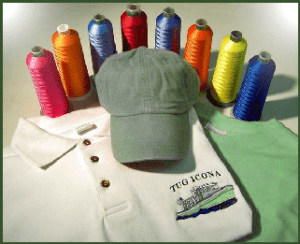 The list of products that can be decorated with embroidery is extremely long and includes apparel items like Golf Shirts, Woven Shirts, Tee Shirts, Sweat Shirts, Caps, Robes and Jackets as well as other items like Bags and Towels. There are also hundreds of thread colors to choose from that allow us to match almost any color and we offer metallic threads too. Let us know what you have in mind and we will gladly work with you to create a program that keeps your employees looking good and will enhance the image that you present to your customers.